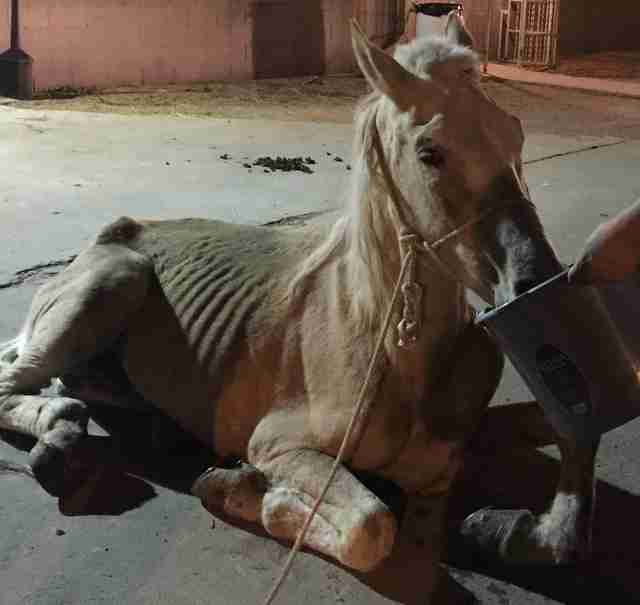 Three weeks after The Dodo published a disturbing story about hundreds of horses being neglected or dumped on the streets of Houston, Texas, the first horse has been rescued in a new effort between the local police department and welfare groups. 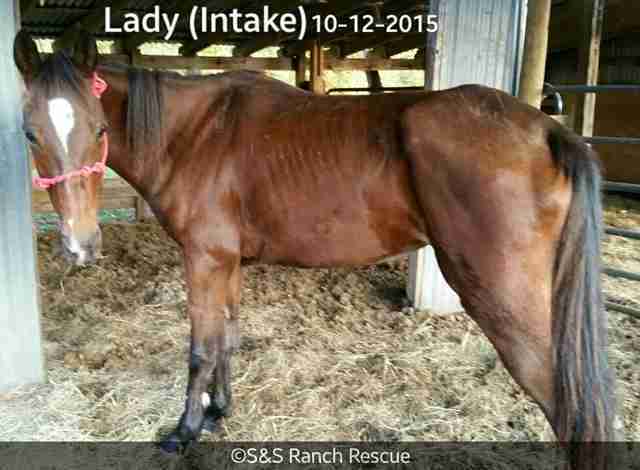 Lady - a 5-year-old mare who survived for months on her own by eating dirt, rescuers believe - was taken out of the Acres Homes neighborhood within an hour of the first official meeting between the Houston Police Department and two equine rescue organizations. The October 13 meeting occurred to specifically address the crisis that has found scores of horses suffering in the area on a daily basis. 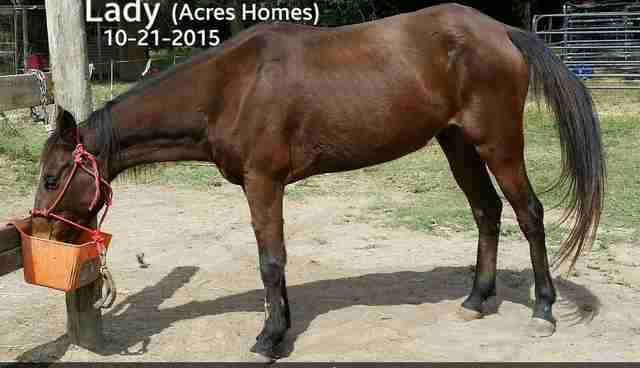 "Lady would not have made it through the night," Amy Whitaker, founder of New Caney Equine Rehabilitation Center, told The Dodo. Whitaker was at the meeting, along with Stacy Pipkin - owner of the S & S Ranch in Cleveland, Texas, an equine rescue and rehabilitation center - and three police officers, including Captain Larry Baimbridge. 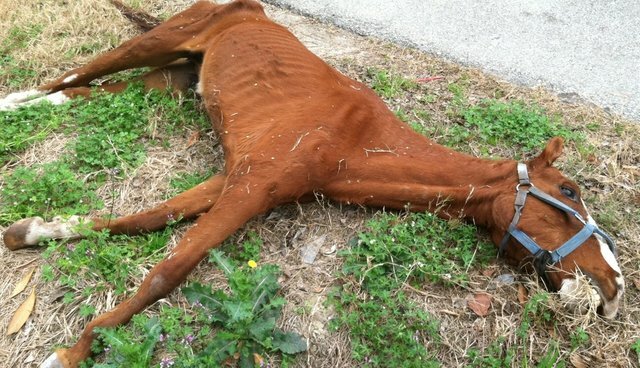 Baimbridge oversees the Acres Homes area of Houston and was centrally featured in The Dodo article; in it, he expressed deep concern about the ongoing abuse, neglect and suffering of hundreds of horses in a situation that was only getting worse. At the end of the initial meeting, Whitaker says she toured the Acres Homes neighborhood with one of the officers: "By the second street, I saw six neglected horses." "She was lying down," explains Whitaker. "She was colicking [loose term for abdominal pain, but can be life-threatening]. She was in distress. And I told the officer, "We have to rescue her now.'" The horse was tied to a barn by a 20-foot rope, Whitaker says. And it later became clear to the rescue groups that Lady hadn't had proper food or water for months. The rescue situation became complicated, however, when a neighbor came out of a nearby home and said the owner of the horse was on the way. The "owner" was a 13-year-old boy (her previous owner was his aunt, who also came to the site, according to Whitaker). The officer persuaded the family to surrender Lady, and within the hour, Whitaker went back to her rehabilitation center, fetched her horse trailer and retrieved Lady. She brought her directly to Pipkin's ranch (the two women work in tandem, where Pipkin says she stabilizes a rescue horse, then sends the animal to Whitaker, who will find the animal a new home after a strict review of applicants). Captain Larry Baimbridge took this photo of Monty, a horse he found on the streets in Houston who died shortly after this photo was taken. "I never thought I'd be so affected by a horse," he told The Dodo. Lady, says Pipkin, has made tremendous strides since her rescue on October 13. "She is doing remarkably well," Pipkin told The Dodo. "She has put on weight already, which is great." Pipkin says she thinks Lady might be available for adoption as early as the end of November. Captain Baimbridge says he hopes to rescue more horses but the reason only Lady has been fortunate enough to be yanked out of a deplorable situation is that he's trying to be methodical. "We want to make sure we are doing it right and won't set us back," Baimbridge told The Dodo. "My concern is if you don't do it correctly or jump the gun or don't do it properly, it could hurt us. We want to make sure that down the line a judge doesn't come down against us or there is an injunction that wouldn't just hamper but stop the effort altogether." The other day, he explains, a horse got loose and got hit by a car. "All four legs were broken. It was awful. 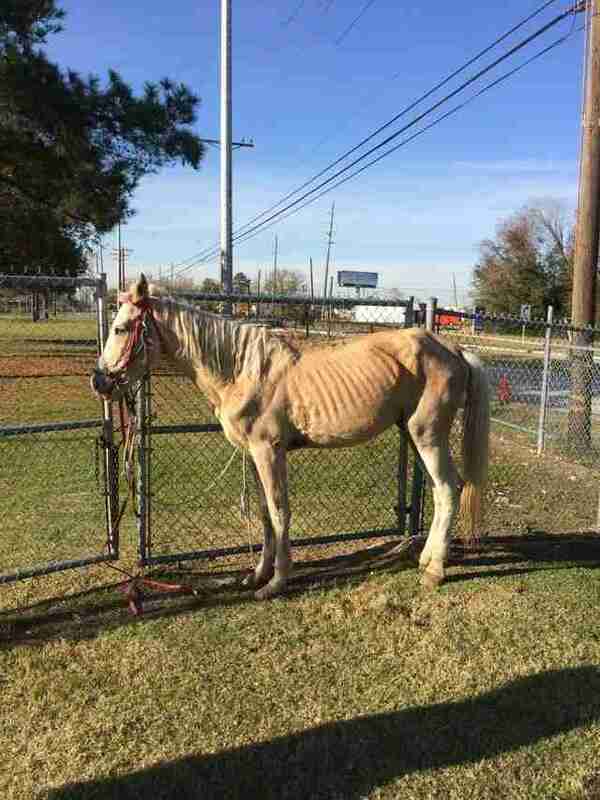 It's part of this whole problem - not just the neglect, but that the horses are running free [being uncared for]. So they get hit by cars." The sergeant called him, he says, devastated. "Eventually, the horse had to be put down. But I think this sergeant realized ... well, we all do: We are taking this so seriously. Now, we've got two officers who go out now twice a week, just on this. And look, we've got 235,000 people to focus on. And to be honest, this is an this issue is that it strains our resources: We have so many other things to deal with - robberies, burglaries, aggravated assaults. From a lot of people's perspective, they think 'This isn't your job.' "But it is our job. Because the reality is, no one else has been able to fix it. And it's the right thing to do." "A lot of this is new territory," Baimbridge adds. "Rescuing horses isn't something we have, as police officers, have traditionally been involved in." Baimbridge says besides the help of Whitaker and Pipkin, he still continues to work with the Houston Humane Society, which has also been working to rescue the horses from Acres Homes. A meeting just yesterday, says Baimbridge, resulted in the decision to offer free microchipping and veterinary care for the local horses, along with continued educational efforts. After the original article by The Dodo, Baimbridge said he received an overwhelming amount of support - not only from his own Houston department chiefs, but from people all over the United States and "even so far as Sweden and Italy." Baimbridge says he knows the effort to save the horses being dumped, neglected or outright abused in Houston will be both a long- and short-term project: "I'm hoping within the next three or four months we will have a pretty good hold on things in terms of stemming the flow of horses needing rescue and getting the more egregious cases of neglect addressed." But changing the minds of the people in Acres Homes might take longer: "It would be two or three years," he says. But, he adds, "my hope is that in that time period, things will change. And those who are driving by a horse tied to a tree, they will slam on their brakes and go, 'What is that?!' - and do something." Because right now, he says, seeing a horse tied to a tree in his home city is so common, people just keep on driving by. To read the first part of this series on the horses in Houston, go here.